Surprisingly enough getting a car park at Mornington Pier wasn’t the challenge we thought it was going to be. There were a few other divers at the pier enjoying the fine weather, but when we turned up with 7 divers all carrying 4 tanks each, things became a little bit crowded under the water. After 70 minutes we made our way back along the pier to our exit point, once again scrounging through some of the large crater size holes in the sea bed left by the boats working above, I managed to pick up more nice bottles. This time there was nice variety of soft drink bottles, the bottle on the left is a Milk bottle, then a Coca Cola bottle, then some type of general medicine bottle (? 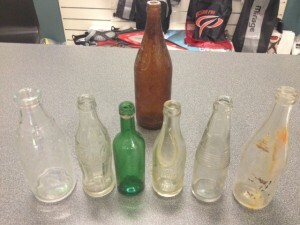 ), a R. Mosley (of North Melbourne) cordial bottle, a Fanta bottle and then a Schweppes Indian Tonic Water bottle and the bottle at the back is just an old beer bottle but I like the older style beer bottles so I kept it anyway.